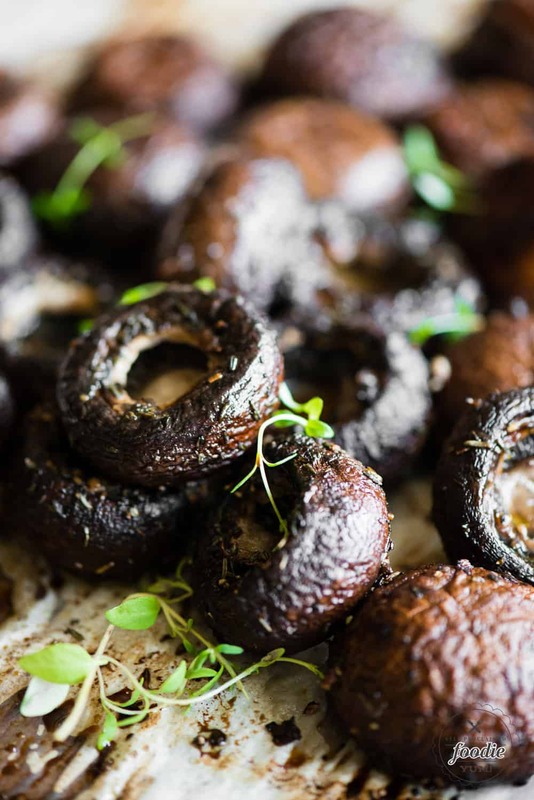 Balsamic Roasted Mushrooms are a healthy vegetarian side dish made in less than 30 minutes with just a few simple ingredients! These roasted mushrooms go extremely well with steak or chicken. I’ve also used leftovers with scrambled eggs and potatoes the next morning for breakfast. Delicious! 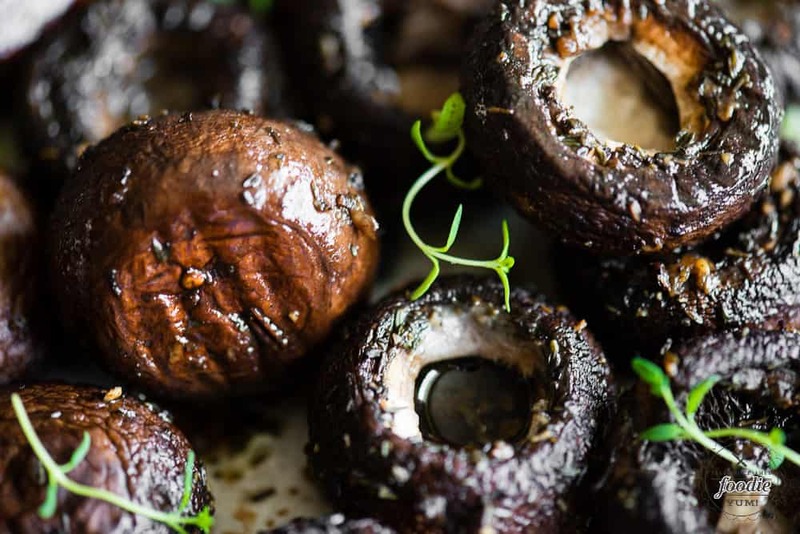 Balsamic Roasted Mushrooms with olive oil, balsamic vinegar, fresh thyme, and garlic are packed with flavor. 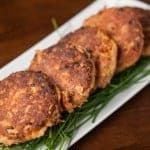 They’re a healthy option loaded with Vitamin D if you’re looking for an easy side dish that will impress! I don’t think I’ve ever been to a high end steak restaurant that didn’t offer a delicious side of hot and sizzling mushrooms to accompany that tender steak! 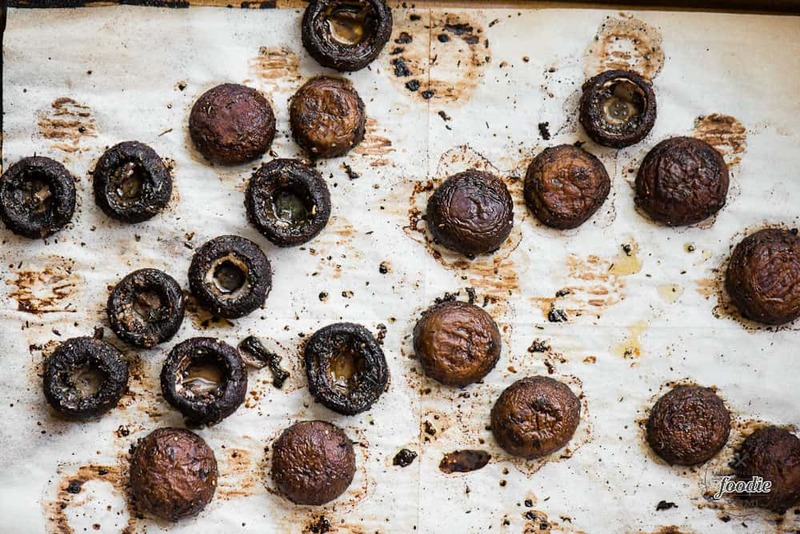 What kind of mushrooms work best for roasting? Any kind! I’m a lover of mushrooms and I don’t think I’ve ever had a roasted mushroom I didn’t like. For this recipe, however, I recommend baby Portabellas. They are very similar to the common white buttom mushroom that we all know, but they are more brown in color. I think they have a lot more flavor and roast up beautifully. 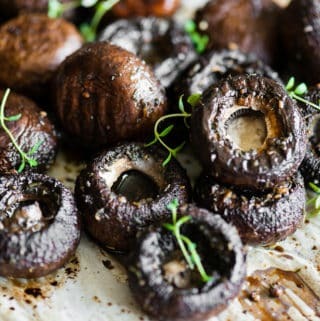 I prefer to use the baby portabellas in this recipe to create bite sized pieces without having to cut them, but you can easily use this recipe to roast giant portabellas as well. You would just have to increase the cooking time to accommodate. Roast time depends on the temperature as well as the size and type of the mushroom. When I roast vegetables or meat, I prefer to use a hot temperature. 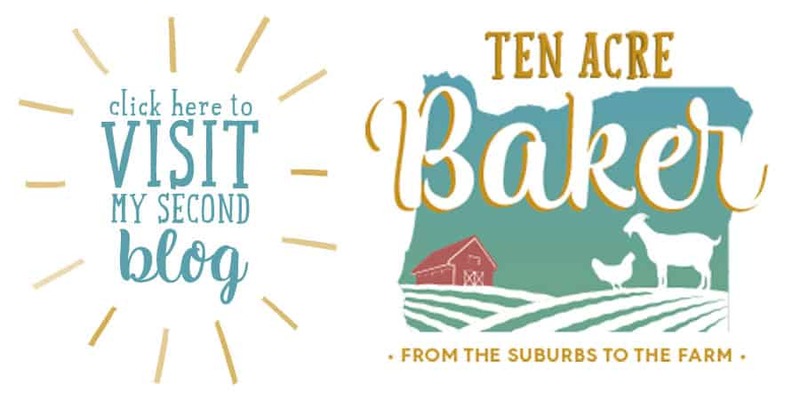 This gives me the browning on the outside I desire without over cooking the inside. For these small mushrooms, I recommend cooking for a total of 20 minutes while flipping half way through. If you choose to roast your mushrooms in the oven at a lower temperature, or use larger mushrooms, you’ll have to increase the cooking time. I absolutely love this combination of balsamic, thyme and garlic. The flavors mingle perfectly. 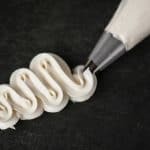 There are a lot of ways you can change up this recipe, though, to get delicious results with just a few changes. Ever try white balsamic? I find it to be a little less strong and a less sweet. Might be a nice change! Rosemary is a favorite herb of mine, especially when I’m roasting vegetables in the oven. Try adding rosemary or swapping it with the fresh thyme entirely! Toss the mushrooms in grated parmesan. You’ll still have a vegetarian side dish but it will no longer be vegan. But hey – if you’re serving it with a juicy steak that’s not really a concern of yours, right? 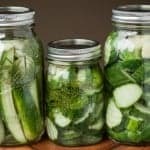 In a large bowl or resealable plastic bag, combine all ingredients and toss to combine. 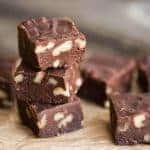 Spread onto baking sheet into a single layer. Roast in preheated oven for 20 minutes, flipping over halfway through cooking time. My mouth is watering! This sounds like a delicious alternative to the simple, sauteed-in-butter method we usually make.